With the introduction of 10 new Studio dies, I’ve been busy. I created quilts for three of the ten dies. The quilts I designed and made were the Crazy Quilt, the Hunter’s Star, and the Christmas stockings. AccuQuilt has published a blog about the new dies and you can see pictures of the projects I made. Where did summer go? We’re well into the new school year and as busy as ever. The dahlias are blooming with their last hurrah for the warm weather. The hurricane season has brought incredible humidity here in North Carolina but we’ve been fortunate in this part of the state not to have had a lot of rain and wind. This photo of a bouquet that my husband brought in last week was taken a few days later, so the blooms are beginning to lose their initial glory, but they’re still beautiful. 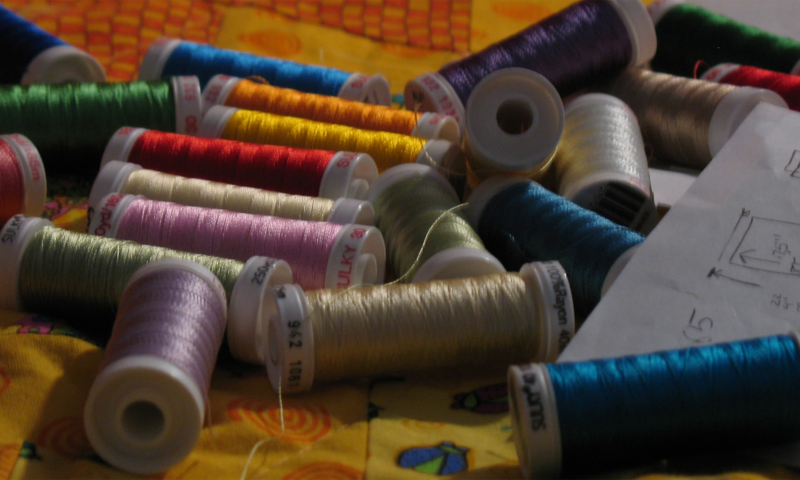 And what about quilting you may ask–as that’s the primary subject of this blog. Well, there have been weeks when quilting has been happening and other weeks when it hasn’t. For the past year or more, I was writing a monthly blog for AccuQuilt. I needed a vacation from writing, but now I am on target to start again in the near future. Another passion of mine and the “Slap Happy Quilters” group with whom I stitch on a regular basis is making comfort quilts. Hopefully our quilts bring comfort to all the cancer patients at the Alamance Regional Cancer Center. So here are a couple of recent completions. They’re still flimsies as I haven’t had time to quilt recently–I’ll tell you why after these pics. This is a quilt pattern that we call “Shirley’s Quilt” because it is in memory of one of our quilters who is no longer with us. It always brings back special memories to me when I make this pattern. It is made of bricks cut 3-1/2 x 6-1/2″ and squares cut 3-1/2″. I used Shapes 8 and 5 from the AccuQuilt GO! 12″ Mix and Match Blocks Qube to cut these pieces and the 3-1/2″ strip die to cut the horizontal sashing and border and the 2-1/2″ strip die to cut the vertical border. And here is another quilt I made using leftover bricks from Shirley’s quilt, but cutting them down to 2-1/2″ x 4-1/2″ bricks. It’s also one of my favorite patterns. I used Shape 8 from the AccuQuilt GO! Mix & Match Blocks 8″ Qube for this one. This one still needs a border and to be quilted. This is the block for this quilt. What I love most is that it can be made with any size brick and looks wonderful as a scrappy quilt. Every other block in this quilt turns 90 degrees, so the only seams to match are the corners of the blocks. That makes stitching blocks together into a top so easy. And this is the reason I never get anything done–but they’re so, so cute! A couple of weeks ago, we spent a full week with our grandsons in Ohio. They are twins (8 years old), middle child (5 years old), and youngest (2 years old)–such an incredible amount of energy and fun and imagination in one house is amazing. This is one of all four boys at the zoo. You can see the little one in green running ahead. The twins have wanted to sew for a long time. Mom’s sewing machine needed service and repair the last time we were there. It had not been used in such a long time that the presser foot would no longer go up and down. Thus, in the interim we found a Pfaff dealer and the machine was serviced and repaired. My friends, Wanda and Sherry, have made jelly roll race quilts with their granddaughters/nieces and that gave me the idea of what to make with the boys. One full jelly roll (42 strips) will make two lap quilts with a three inch border all around. This was much more difficult than I imagined. Somehow my daughters learned to sew when they were 8-10 years old, making things like t-tops and shorts and it seemed easy for them. However, they both had been sitting at a machine (first on my lap) from the time they were old enough to sit. And then they made fancy stitch samplers using variegated thread by just selecting the stitches and pressing the foot pedal. The boys had a very hard time stitching a straight seam–the seams always seemed to veer into the middle of the strip or off the edge. One of the twins wanted to race with the pedal to the metal and the other twin wanted to stitch one stitch at a time–both methods had serious issues for the teacher. Fortunately the Pfaff has a “sew slow” button. We did get the quilts finished. I brought the tops home with me to add borders, quilt, and bind. I didn’t gete any pics of the boys sewing, but here are pics of the quilts on the quilting frame. There are six grandsons and three granddaughters in our family now. The boys love quilts. Recently the oldest boys (twins) made their own jelly roll race quilts in blue and green.Their brother (a middle child) has chosen orange as his signature color. Even though this is not my favorite color, last year I did crochet my way through a very large orange “blanket” for him. And then, this week, as he’s lying on the couch with a 102 degree fever, he announces that he wants Momma B to make him an “orange star quilt”. Orange is not a dominant color in my stash, although there are some pretty orange-gold batiks and one bolt of orange cotton that is truly not a pretty color. Needless to say, I have spent time over the past few days auditioning and making star blocks to find a color and design that he likes. Sometimes it’s hard to believe how picky a five year old can be. First, let me show you the one he finally chose, and then the pictures after that are the ones that were rejected.